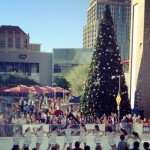 Wire* — The Valley’s largest and most visited outdoor holiday ice rink, CitySkate at CityScape Phoenix presented by APS, is back for a seven-week run starting November 24 and this year the annual event will partner with a number of local nonprofits and Phoenix Art Museum, bringing the community and arts together in Downtown Phoenix. CitySkate is introducing a variety of new activations this year centered on a common theme of giving back. Every Wednesday throughout the ice skating season, CitySkate will “Skate it Forward” and team up with a local organization to raise funds and awareness for their cause. The community is invited to come out and skate from 3-11pm where $5 of every general admission ticket will be “skated” back to one the following participating groups: St. Mary’s Food Bank, 100 Club, Phoenix Sister Cities, Upward & Onward, One N Ten and Arizona Science Center. Also new this year, CitySkate is partnering with Phoenix Art Museum to transform the retail space next to Charming Charlie at CityScape into an interactive art pop-up shop. 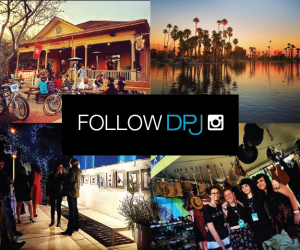 Holiday revelers and those strolling around Downtown Phoenix can enjoy the feature installation, Carcerolazo, by artist Saskia Jordá, as well as experience on-site performances and programs including dance, music and hands-on activities every day. In addition, the Desert Wonderland in the City installation by Joe Pagac will bring the south side of the ice skating rink to life with a 3-D realistic mural blending real desert and painted plants to act as the perfect backdrop for family photos, group shots or selfies. 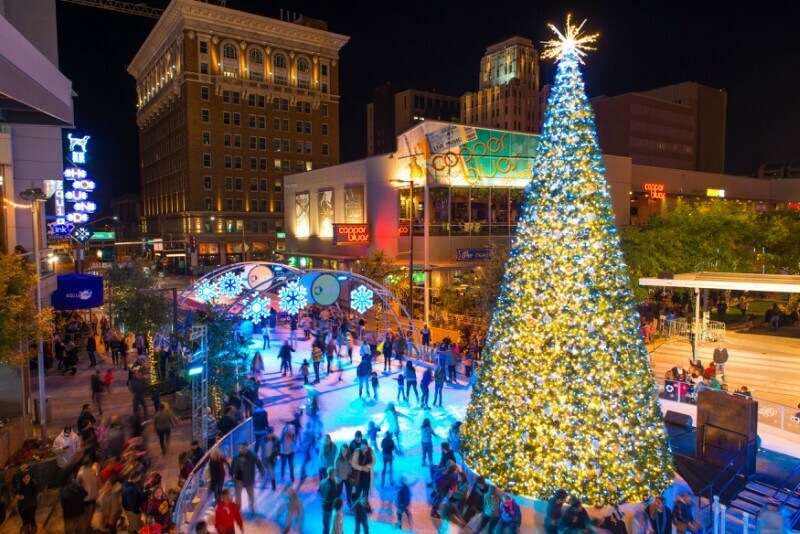 For the eighth year running, CityScape will be transformed into an ice skater’s dream with a massive 36-foot holiday tree dramatically placed in the center of the real ice rink along with hundreds of thousands of twinkling lights. Bystanders watching over the rink from Patriots Park can sip a cup of hot cocoa from the Hot Chocolate Bar hosted by Copper Blues where a portion of each cup sold will benefit a Girls Scouts of the USA local neighborhood group. 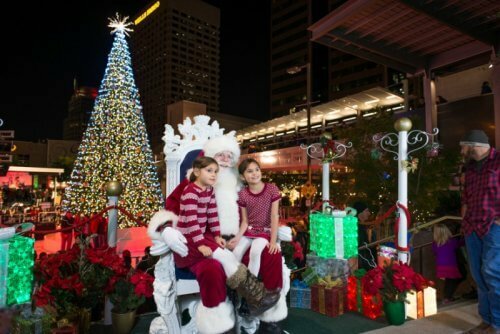 Santa will make an appearance every Saturday and Sunday for photos from 4 p.m. until 8 p.m. and those taking the light rail in can even catch a ride with Kris Kringle himself on select days and times. 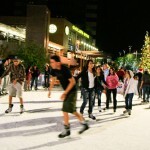 The official grand opening and tree lighting ceremony will kick-off all of the holiday merriment and skating season on Saturday, November 25. 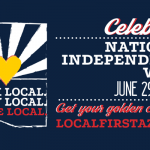 The event will showcase performances by Phoenix’s top performing arts organizations including Phoenix Symphony, Phoenix Opera, Herberger Theatre, Ahwatukee Foothills Nutcracker and the All Puppet Players Theatre. 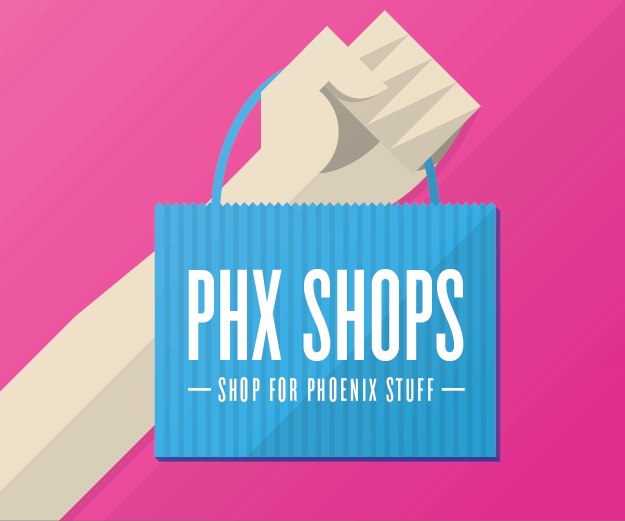 The Phoenix Art Museum pop-up shop will also be open to the public and will be hosting a must-see interactive performance while characters from favorite children’s movies will be making their rounds throughout the day like Anna and Elsa from Frozen. 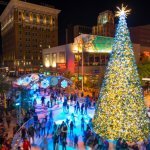 For those looking to extend their holiday festivities, Kimpton Hotel Palomar Phoenix is offering a “Stay & Skate” package that includes beautifully appointed deluxe accommodations, 15 percent off the best available rate starting from $127 per night, two tickets to CitySkate that include skate rentals and 20 percent off at Blue Hound Kitchen & Cocktails. The Stay & Skate package can be booked online or by calling 1-877-488-1908 and mentioning the package by name. The package is available from November 25 until December 30. 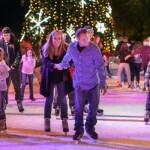 Ice skating from 3:00 – 11:00 p.m. 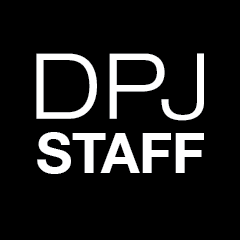 Performances and Santa Claus Arrival: 4:00 p.m.
Visit here for a list of special happenings, holiday hours and closures. Tickets can be purchased at the ice rink and admission includes skate rental and skating for the designated session purchased. The ice rink rental is available for private parties and events. Contact (602) 772-3900. November 18, 2011 Downtown Holiday Spirit – Tree Lighting, Skating and Santa!